alaTest a collecté et analysé 39 avis de consommateurs et d'experts pour le produit Saitek Slimline Keyboard. La note moyenne du produit est 4.4 sur 5, tandis que les autres produits de même catégorie ont une note moyenne de 4.1 sur 5. De nombreux avis apprécient la qualité de construction. La taille impressionne, mais les auteurs d'avis ont des doutes sur la fiabilité. Après analyse des notes de consommateurs et d'experts, de l'âge du produit ainsi que d'autres facteurs, et comparé aux autres produits de même catégorie, le Saitek Slimline Keyboard obtient un alaScore™ de 82/100 = Très Bien. The keyboard is incredibly cheap, but works just as well as any other keyboard. I was a little worried I would have wasted my money on something cheap that doesn't work but I was wrong since I have had hardly any problems with it. 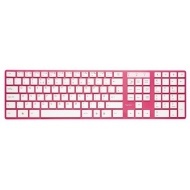 It is a pink colour and now and again a key will get stuck. But jiggle it around and it will un-stick again. Cheap and cheerful! I got this keyboard cause the E had stopped working on my ancient laptop and needed something as a stop gap till I picked a new laptop. Easy to use just pluged it in, works brilliant and is great value for money. A bit clacky but can't really complain at the price. Excellent price and very cute. Does the job well. Takes me back to childhood with the Barbie pink!